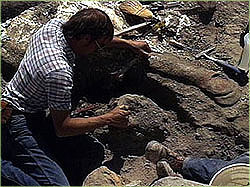 So you want to dig up a dinosaur? Sure, why not? Dinosaurs roamed every continent millions of years ago, so there should be plenty of dinosaur fossils around. What's the catch? Well, you need to know where to look. First, you need to know which kinds of rocks are likely to contain fossils. Rocks are divided into three categories, depending on how they were formed. Click on the one you think is most likely to contain dinosaur fossils. Igneous rock forms from hot molten magma that cools and hardens. Sedimentary rock forms when sediment (such as rock particles or organic matter) become compressed and cemented together as it piles up. Metamorphic rock forms when igneous, sedimentary, or metamorphic rocks are changed by heat or pressure.